Next-door neighbors John Gustafson and Max Goldman are Grumpy Old Men. And since they're played by Jack Lemmon and Walter Matthau, they're also Funny Old Men. The stars of the film The Odd Couple pair up again in this hilarious and heartwarming story of neighborhood curmudgeons whose long-running feud becomes an all-out rivalry when an attractive widow (Ann-Margret) moves into the house across the street. Snowy Minnesota provides the setting as Max and John unleash an uproarious blizzard of practical jokes and zingers. Burgess Meredith, Daryl Hannah, Ossie Davis, Kevin Pollak and Buck Henry add star-packed support to snow packed shenanigans that "will cure your blahs and jump start your heart" (Rex Reed, New York Observer). This was one that I wasn't really interested in seeing when it first came out. I ended up seeing it on television eventually and really liking it. I've seen it several times since then and decided to pick up the DVD when I found it cheap. The plot is somewhat simple, but it manages to work as an entertaining movie. A few minor complications pop up with a problem John is dealing with and his daughter's marriage problems. The main focus is the contentious friendship between John and Max. They are rather nasty to each other most of the time, calling each other names and doing stupid stuff to irritate each other. Things get worse when they both decide that they are interested in Arial, the woman who just moved in across the street. Most of the humor comes from the relationship between John and Max. They are always calling each other names and insulting each other in humorous ways. Some of the things they do are silly, but that works for the movie. The movie is a lot funnier than I expected it to be before I first saw it. When I watched it this last time, I was having a snack. One of the funnier moments happened and I almost choked when I started laughing with a mouth full of food. So I would suggest snacking while watching this one with caution. Much like I can't snack and watch Big Bang Theory. Several scenes involve ice fishing, something I can't imagine ever doing. Sitting in a little shack on a frozen lake trying to catch a fish just doesn't seem fun to me. But John and Max spend most of their free time doing it. The things tied to ice fishing that are shown are sort of interesting though. There is basically a little town of fishing shacks on the frozen lake. 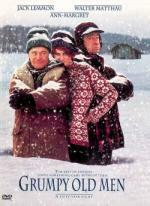 The movie takes place during the winter in Minnesota, so there is also a lot of snow around and it looks really cold, so that part of the movie is realistic. The characters, while not always likable, are interesting. John and Max are definitely grumpy, though they show nicer sides as well. Walter Mathau and Jack Lemmon are wonderful in the parts. They work well together. Arial is nice and it is believable that both men would be interested in her. There are a few bloopers that play during the closing credits that are funny. The only extra are a few production notes that can be read about the making of the movie and some of the cast. I haven't seen this yet, but looks like something I would like. In spirit it's connected to The Odd Couple, where Lemmon and Matthau have played a similar couple. This film was followed by the sequel Grumpier Old Men. And for those who enjoy two old men being grumpy with each other, you should check out My Fellow Americans. It has Jack Lommon and James Garner playing ex-presidents who hate each other. Although as far as I know a widescreen version has never been released. I think it's the only pan-n-scan movie I've ever purchase intentionally. I have My Fellow Americans ..I really liked that one too. I even saw that one in the theater. I'm working on a review for Grumpier Old Men for Epinions now..probably post it later tonight..if the site cooperates. It has been acting weird over the weekend.